My baby girl is 7 months old now, and she babbles and crawls with the best of them! It seems to be happening much faster than it did with her big brother. We had a tiny week off at the end of June, but went to school the whole month of July. Now that's its August, I can finally relax a bit, before gearing up to go back again! My family is all from Kentucky, and I love when they get to come visit. I've booked us a few days at the ocean. I can't wait to take the kids and just relax for a while. I love scrapbooking, but I can never seem to find time for it. But the past two days I've scrapped a few pages, and I hope to keep up the momentum. I'd like to get a whole book done for my daughter, and do several pages for my son's books. I've also been updating and pumping out TPT stuff. I've updated about 5 products, and created 2 products since Wednesday (its amazing how much you can get done in the early hours of the morning before the kids get up!). I hope to finish up 2 more products before the big sale Monday and Tuesday. Teachers go back August 20 for in-services and lunch, then kids will be there August 22. I'm a little nervous what I'm going back to. Construction started on our school Wednesday to build a new media center (library), and I'm afraid all of the books will be in shambles (and its my responsible to organize everything again!). Hopefully everything was packed away carefully - but you never know. I'm totally with you on the morning quiet time - I get so much done! I was in school for much of the summer as well. 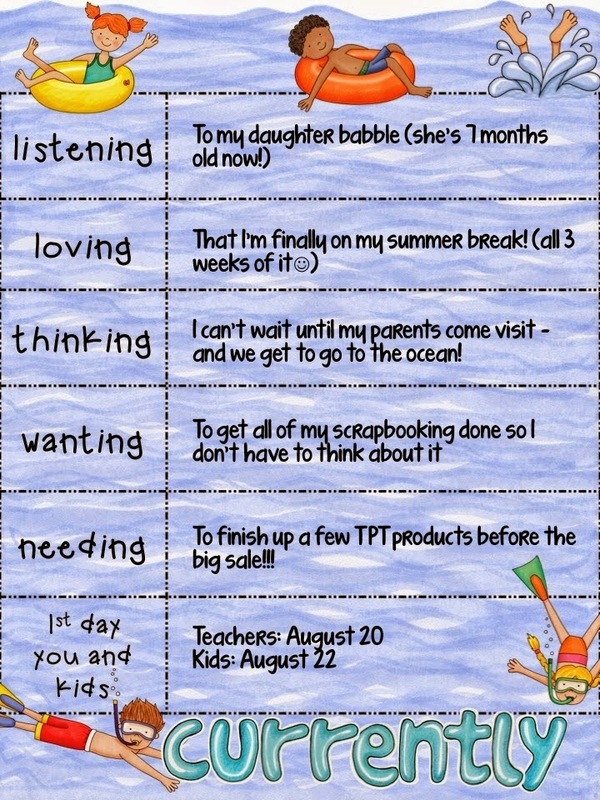 I get about a 2.5 week summer to relax - but really have to plan for school instead. Hope you get some time to relax a bit! Enjoy your break! Do you teach at a year-round school? What I Got (at the TPT sale)!